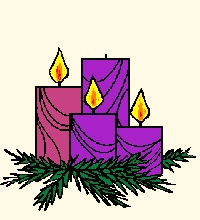 This is Gaudete Sunday, the third Sunday of Advent. The word is taken from today's entrance antiphon, Gaudete Domino semper (Rejoice in the Lord always). It is a reminder by the Church that Christ is not far off. In our first reading (Zephaniah 3:14-18), we hear yet another prophet proclaim to the people that after the days of judgement for their sins, there would come a day when God would renew them in his love. It would be a cause for great rejoicing. Shout for joy, O daughter Zion! Sing joyfully, O Israel! Be glad and exult with all your heart, O daughter Jerusalem! The LORD has removed the judgment against you; he has turned away your enemies; the King of Israel, the LORD, is in your midst, you have no further misfortune to fear. On that day, it shall be said to Jerusalem: Fear not, O Zion, be not discouraged! The LORD, your God, is in your midst, a mighty savior; he will rejoice over you with gladness, and renew you in his love, he will sing joyfully because of you, as one sings at festivals. In our Gospel reading (Luke 3:10-18), we hear a continuation of last week's Gospel introduction of John the Baptist. In today's reading, the people are asking whether John might be the Christ, the long awaited savior who would come in their midst and live among them. John preached the good news of repentance, for the Lord is not far off. In our Epistle reading (Philippians 4:4-7), We hear the passage on which today's Gaudete theme is based. St. Paul sums up its meaning succinctly: "Rejoice! . . . The Lord is near." Brothers and sisters: Rejoice in the Lord always. I shall say it again: rejoice! Your kindness should be known to all. The Lord is near. Have no anxiety at all, but in everything, by prayer and petition, with thanksgiving, make your requests known to God. Then the peace of God that surpasses all understanding will guard your hearts and minds in Christ Jesus. It can be difficult for us, just as it was in the days of the prophets and in the days of the early Church. Through our suffering and our tears, we must trust in God. Our God is a God who fulfills his promises. Indeed this is a cause for rejoicing.